Toddlers are so curious! My own children love love love to see different living creatures. Whether it’s farm animals, insects, or learning about wild beasts, they get so excited! Natasha is 18 months old now, and her vocabulary is just starting to burst. She repeats new words and gets so curious to learn new ones. 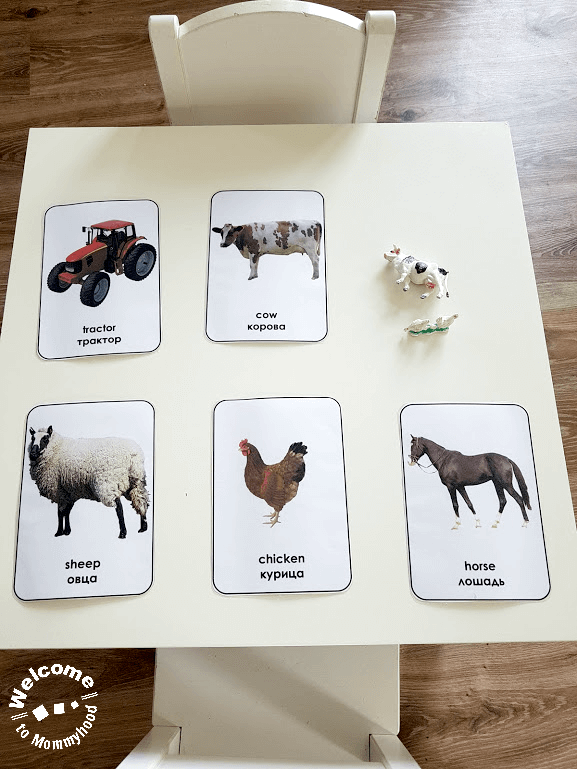 This is why I created a very simple set of bilingual Farm Animal Cards so that we could practice some interesting words together. Toddlers are like sponges. They are absorbing language and learning about the world around them at an astonishingly fast pace! It is amazing how many new words they learn in just one day. At home, we use simple cards like this – with a real image and clear lettering to read like a book. Natasha is only 18 months old right now so reading them like this, reinforcing the words, and practicing language is absolutely fantastic! You can use these cards in multiple ways. For children that are younger, you can use them simply to read like a book and teach vocabulary. We used real images here because young children are still learning what the objects are. For slightly older children, you can add animal figurines. You can present this as a matching work for children. I recommend when making materials for younger toddlers to definitely print on card stock and laminate. The cards have rounded corners so little fingers don’t get cut. Be sure if you do laminate, to also cut rounded corners. She adores these cards. She seriously walks around the house with them pointing to the tractor or the chicken and explaining to us what she sees. Her little eyes, twinkling with excitement! We actually live across the road from a farm and we can see the tractors working during the day. When she sees one driving by, Natasha will run to our cards, grab the tractor, and will point to the tractor outside and then to the card. She is really getting the connection between the real object and the card, as well as the vocabulary! I am beyond excited about her excitement (aaaand about getting to prepare more of such fun little things for her!). Get your own Farm Printables for free! By entering your email above, you are signing up to the Welcome to Mommyhood newsletter. You will get occasional emails from us with more awesome printables for free or from our shop.